DDX21 antibody recognizes nucleolar RNA helicase 2, also known as DEAD (Asp-Glu-Ala-Asp) box polypeptide 21, DEAD box protein 21, DEAD/H (Asp-Glu-Ala-Asp/His) box polypeptide 21, Gu protein, RH II/Gu or RNA helicase II/Gu alpha. Rabbit anti Human DDX21 antibody recognizes nucleolar RNA helicase 2, also known as DEAD (Asp-Glu-Ala-Asp) box polypeptide 21, DEAD box protein 21, Gu protein, RH II/Gu, RNA helicase II/Gu alpha, gu-alpha and nucleolar RNA helicase Gu. DEAD box proteins, characterized by the conserved motif Asp-Glu-Ala-Asp (DEAD), are putative RNA helicases. They are implicated in a number of cellular processes involving alteration of RNA secondary structure such as translation initiation, nuclear and mitochondrial splicing, and ribosome and spliceosome assembly. Based on their distribution patterns, some members of this family are believed to be involved in embryogenesis, spermatogenesis, and cellular growth and division. Encoded by the DDX21 gene, nucleolar RNA helicase 2 is a DEAD box protein, which is an antigen recognized by autoimmune antibodies from a patient with watermelon stomach disease. This protein unwinds double-stranded RNA, folds single-stranded RNA, and may play important roles in ribosomal RNA biogenesis, RNA editing, RNA transport, and general transcription (provided by RefSeq, Jul 2008). 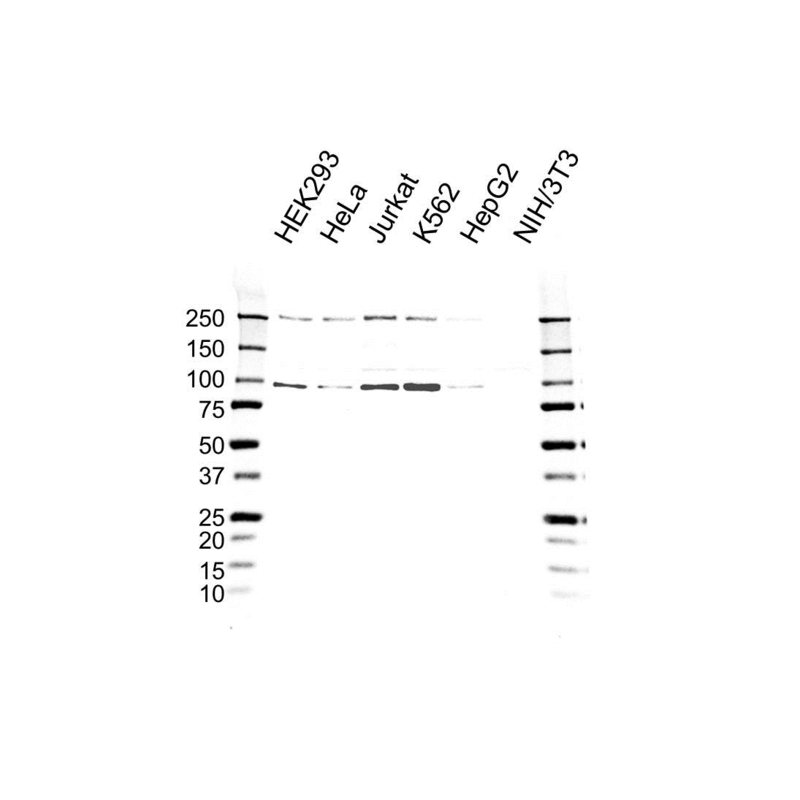 Rabbit anti Human DDX21 antibody detects a band of 87 kDa. The antibody has been extensively validated for western blotting using whole cell lysates.